In my very first blog post, Peace from the Pieces, I mentioned the project I have been working on—ghostwriting a book about someone else’s ancestor—and how that work fueled my curiosity about my own family legacy. 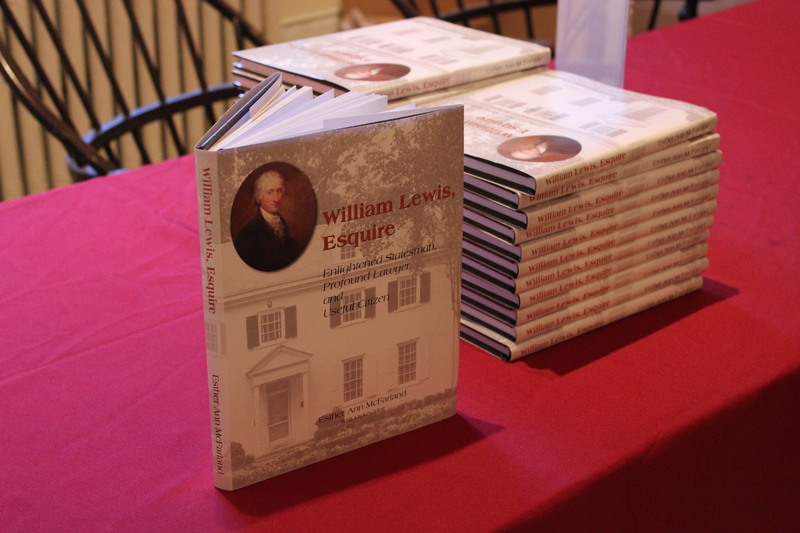 Last month, the book William Lewis, Esquire: Enlightened Statesman, Profound Lawyer, and Useful Citizen was officially published. 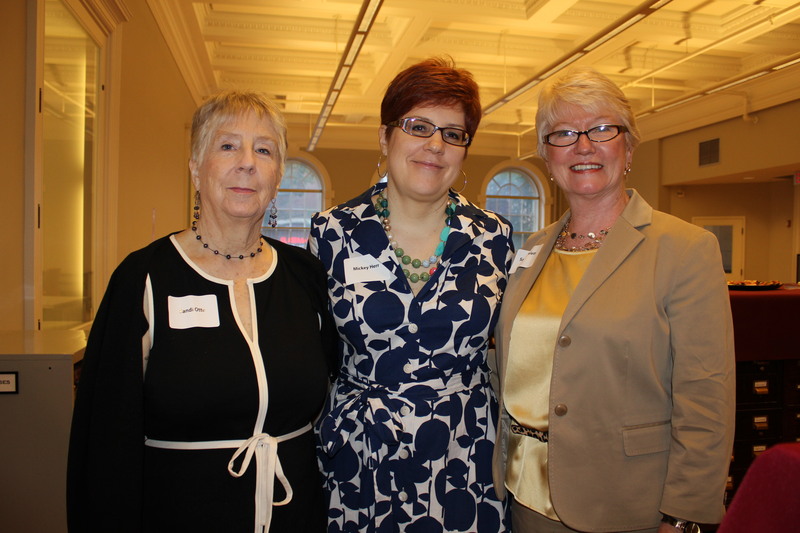 At the end of June, The Historical Society of Pennsylvania hosted a lovely event to celebrate the memory of Esther Ann McFarland (the author and woman I worked for) and publication of the book. I have to admit that since the party, I have taken a bit of a mental vacation…I’ve done little writing (fictional or otherwise), no genealogical research…no “production” of anything new. Perhaps that is how it should be. Perhaps I am still letting go a bit before I can refocus on what’s left before me. In the meantime, I thought I’d share a few photos and words from the event. It meant a great deal to be able to share my experiences with the attendees—my relationship with Esther Ann and the process of becoming a ghostwriter and later co-author of the book. I was grateful to have my mother, husband, and several close friends in attendance, as well as many of the people who helped along the way. A nice crowd of people came out to honor Esther Ann. She had many friends and those in attendance represented a number of important local organizations: The Historical Society of the US District Court (Eastern PA), Historic Strawberry Mansion, Philadelphia Parks and Recreation, The American Swedish Historical Museum, Daughters of the American Revolution (among others), and of course The Historical Society of Pennsylvania who hosted the entire event. Those of you interested in history, specifically Philadelphia history, and especially the history of law, will enjoy reading the book. William Lewis, like many American Patriots, was a man who wore many hats. A leader of the Philadelphia bar before the American Revolution, he would continue to build his legal reputation by defending those accused of treason, and during the Early National period he would become the leading authority on trade and maritime law. He would serve as a leading counselor to the Pennsylvania Abolition Society throughout his life, after helping to draft the Act for the Gradual Abolition of Slavery in Pennsylvania. 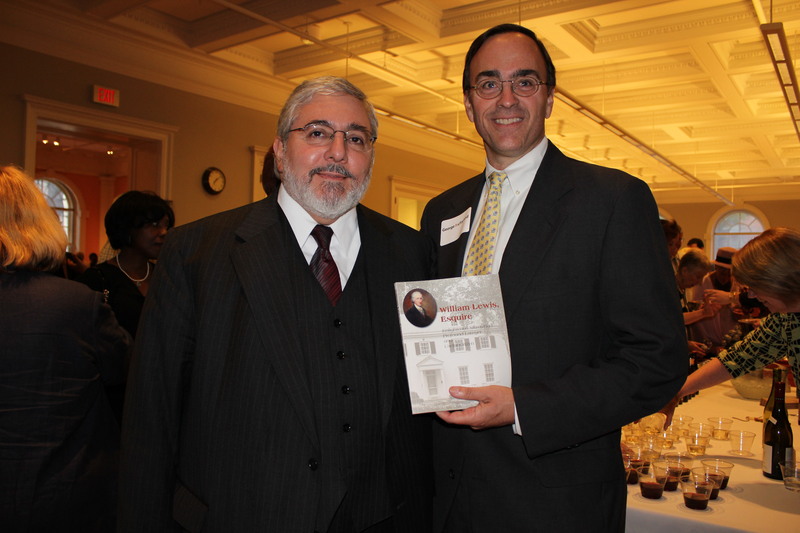 Lewis was an avid Federalist and politically active at both the state and federal levels. President George Washington appointed Lewis the first United States Attorney for the District of Pennsylvania and later the second judge of the District Court of Pennsylvania. He was one of the first attorneys admitted as counselor to the bar of the United States Supreme Court and was called upon to provide advice and counsel to a number of high-profile individuals including Alexander Hamilton and Thomas Jefferson. 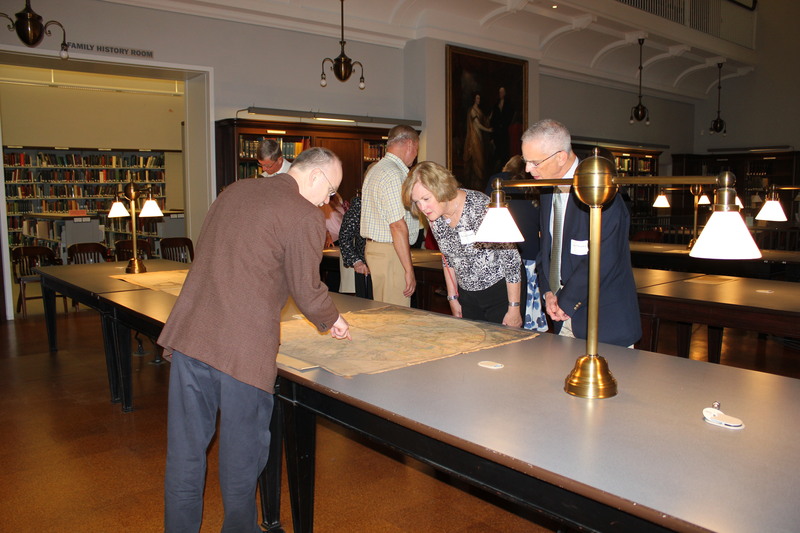 Lee Arnold in HSP’s beautiful reading room where attendees could see first-hand some of the important documents used in writing the book on the life of William Lewis, including rarely seen early maps and William Rawle’s journals. I enjoyed getting to know Lewis through the eyes of his great-great-great-granddaughter and through the eyes of his friends and students who often wrote about him in their journals and letters. In time, I found that, like those before me, I also found William Lewis to be quite an interesting man. “What Would William Lewis Do? That was the question I found myself asking as I read a newspaper article about the case of Carol Anne Bond v. United States, a Pennsylvania case that reached the United States Supreme Court in early 2011. Not your typical Supreme Court fare…the case involved a love triangle, chemical weapons, postal inspectors, an international treaty, and the 10th Amendment. The 10th Amendment you may remember makes explicit the idea that the federal government is limited only to the powers granted in the constitution. Add in the concepts of separation of powers, federalism, and an individual’s right to liberty and there is no doubt in my mind that William Lewis would have led the charge in defending Carol Anne Bond—despite her guilty plea—in arguing that the federal government had gone too far in using a terrorism statute, to prosecute a domestic dispute, that should have played out in a state court. So, you may ask…how did I find myself pondering the thoughts of an 18th century attorney while reading about this modern day Supreme Court case? I blame it all on Esther Ann McFarland. 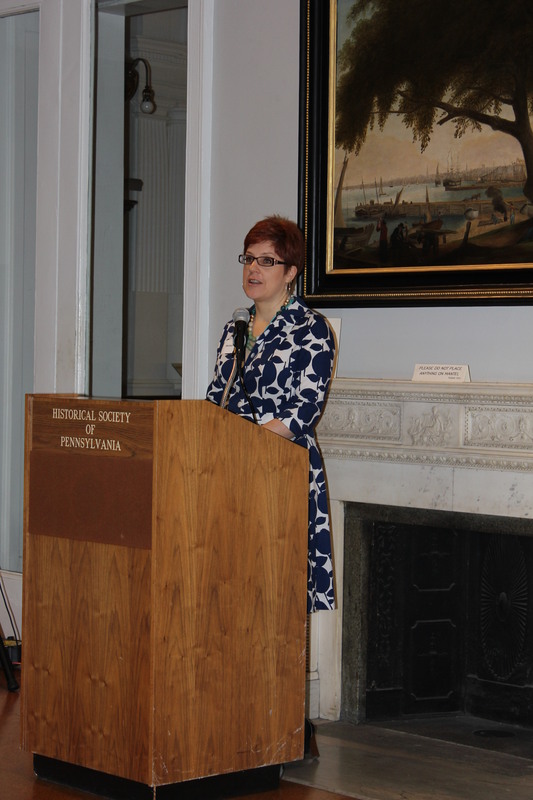 In one of those “the universe works in mysterious ways” circular moments…I first became aware of Esther Ann more than eight years ago, while I was working here at HSP [The Historical Society of Pennsylvania]…right upstairs in the President’s office. I actually first encountered her when I “found” her in our database…a Mrs. George C. McFarland, who like clock-work, diligently made annual contributions in support of HSP. Multiple changeovers in staff meant that no one in the President’s office at that point had any knowledge of her…so I decided to give her a call to introduce myself and to invite her to an upcoming event for our newly formed Treasures Society. The Treasures Society, I informed her, was a special group of our most dedicated supporters…a group she was already well-qualified to join based on her long history of financial contributions. Of course, we all fell in love with Esther Ann when we met her at the party… this spry & petite lady who was so full of love and laughter. Afterward I sent Esther Ann a picture that was taken at the event… of her with then HSP board president Colin McNeil…both sporting brightly colored gold jackets and broad smiles…so off the picture went…and I don’t think two days had passed before I received a note in reply along with yet another generous contribution. This was the start of a renewed relationship between Esther Ann & HSP. In all of us, myself, Lee Arnold [Director of the Library at HSP], and other staff members, EA found a whole new audience to enlighten about the venerable esquire William Lewis, her great-great-great-grandfather. And somehow, we all became sucked into the project… Lee’s staff was processing the papers of the Pennsylvania Abolition Society, so he was on the lookout for any mention of William Lewis…through the years Lee would continue to send EA tidbits he’d come across, anything he thought might be of interest to her. Even after I left my position at HSP, as we maintained our friendship… I kept track of her progress on what became known as “the book.” “How’s the book?” I’d ask as if it were a person… During this time period she decided if she was going to complete this project…turning all of her years of research into an actual published book… that she needed help organizing and writing. I sent a few of my writer friends her way in hopes that they could work as her ghost… it took awhile but I was happy to hear that she had finally hired someone to help. And having followed the project for a number of years, I thought I’d had an understanding of what I signed on for… and then I was introduced to more than forty years of research…overflowing filing cabinets and boxes…and all the stories Esther Ann wanted to include in her book. That was just the beginning…of what Esther Ann had in mind when she pictured her book in her mind’s eye… so I started to dig into her research and ponder how all of this might come together into one cohesive manuscript. So, we were not just writing a book…Esther Ann was not going to rest until she could ensure—by whatever means available—that the legacy of her great-great-great-grandfather would not just live on… but would be interpreted correctly and not be forgotten a second time. William Lewis’s contributions to our nation are certainly important…and the fact that a case such as Carol Anne Bond v. United States could be heard in the United States Supreme Court in 2011 is certainly a testament to the work of William Lewis in setting the earliest legal precedents. For those of you interested in reading the book, it is available on Amazon.com and also directly from the publisher at www.dianepublishing.net . If you live in Philadelphia, there are copies on sale at The Historical Society of Pennsylvania (corner of 13th and Locust). I just ordered the book from Amazon and am greatly looking forward to reading it. Thanks Becky! Meant to send you the link earlier and forgot! Hope you enjoy the read. It’s an incredibly fascinating book. I have loved making my way through it and getting to know this special man! Hi! I came across your blog a few weeks ago while I was doing some research on my family (the Zortman’s) history. Great posts in the past as well as this one! Will you be going to the Z-Fair in a few weeks? No Z-fair this year unfortunately. Would love to hear about your experience should you attend. Would also love to hear about how your branch became Zortman with an “O”… my family tends to pronounce the name that way, but kept the “a”. Keep in touch & glad you’ve enjoyed the posts. Thanks!